Thailand, a country full of amazing sights, colours, culture and food! Unfortunately, we didn’t do a lot of traveling around Thailand; instead, we had an incredible family trip to Phuket. Two weeks sounds like a long time in one place. However, we spend every day of our lives running around and being constantly on the go, so two weeks of relaxation was ample time to rejuvenate and spend quality time as a family. We started off in full swing. After a 14-hour journey, rather than crashing at the sight of our beds, we quickly freshened up and were up and about roaming the local streets, eyeing up restaurants and exploring the maze of evening street merchants. The night life around Karon Beach is simple yet exhilarating. Taking each day as it came, we saw loads of places, missed a few attractions (like Phi Phi Island) and made a number of new local friends. The first day started off as an exploratory mission: we got a feel for what was around us, checked out Karon Beach and met the locals. Supposedly, August is winter on that side of the world, but given that temperatures were generally between 35 and 40 degrees Celsius, there was no chill in the air. The few stormy showers at this time of year may be off–putting, but with short 10–minute bursts of torrential rain followed by the bright sun, we were dry just as quickly we got soaked! We made our first friends on this exploration – they invited us to a Hindu temple up in the hills between Kata and Chalong and we made a note to go the following day. This was exciting for my parents to say the least. That evening we visited an evening market on the Wat Suwan Khirikhet grounds that runs from 4pm until late every Tuesday and Sunday. Like most markets, you can find stalls selling everything from clothes and electronics to souvenirs along with rows and rows of street food stalls. I actually bought a couple of pairs of good sunglasses for just a few pounds, which I am still using a few trips on. Being vegetarian, we were extremely cautious about the street food, but it’s definitely worth trying if you have the stomach for it. I’d recommend exploring outside of the hotel and asking a few tour guide shops that sell excursions. If you are in the middle of a busy area, like Karon or Patong Beach, you’ll find plenty of these around. Haggling with them to get the best price can save you a few hundred Baht along the way. Speaking of Patong Beach, a must–see is Bangla Road. By day, this is a street full of bars and tourists. By night, the road is blocked off to cars and things get crazy! Let‘s just say, this is not a street you want to walk down with your parents at night, I’ll leave you to your imagination on that one. The Thailand “Ladyboy” population is vast, and to celebrate this Simon Cabriolet was created. A full “Ladyboy”-only cast entertains the audience with a mixture of Thai culture, music, humour and raunchiness. Taking the parents was of course one of the most awkward experiences in my life, but they were probably just as amused as us! Phantasea, a popular show in Phuket that is favoured by most tourists, takes you on an exciting journey through Thailand’s history and culture. As we had time on our hands, we then headed to see Siam Niramit towards the end of our trip. It wasn’t as elaborate as Phantasea, but it did give a great insight into Thai culture and so it is worth seeing if you have the time. Ko Khao Phing Kan Island is one of the most popular islands to tour in Phuket. It’s more commonly known as James Bond Island since “The Man with the Golden Gun” was filmed here. I’d recommend taking the speedboat rather than the long boat as you get to see more places and spend more time on the islands. During the tour, we visited various islands and a bat cave. This involved close encounters with the bats (one flew straight into my leg). The tour then continues onto James Bond island. We explored each corner of the island and took a few touristy pictures (as you do…). The trip included lunch on Panyee Island and we had time to tour the island’s small village and maze of streets and shops. Upon leaving Panyee island, our speedboat experienced a spot of engine trouble. We made it just in time (slowly but surely) to jump into the canoes for a calming tour through the lagoon around Hong Island, whilst the crew attempted to salvage the speedboat engines. In the middle of the sea with one engine pushing us along slowly, we made it Naka Island. At least we weren’t stranded at sea. Whilst waiting to be rescued by a new boat to return us to the mainland, we took a quick dip in the clear blue sea and relaxed on the soft clean sand under the beautiful shining sun. 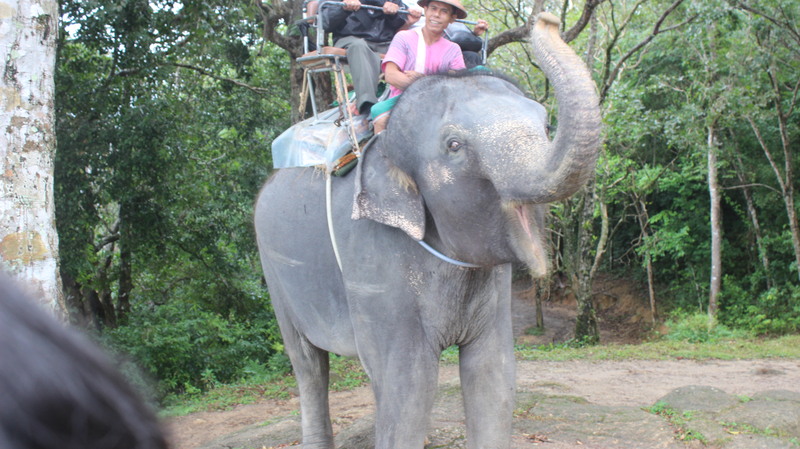 Elephant trekking is one of the most talked about things to do in Phuket. I’m generally against chaining animals up for entertainment, so we did our research (more so my sister than me), and decided on the 4-in-1 safari tour with Siam Safari which included a sunset dinner cruise. The weather was against us on the day, but we still powered along for the tour unlike many of our fellow tourists. We’d paid for it, and were not going to let a little rain ruin the fun. As a result, we had a tour guide all to ourselves! It was great – the atmosphere was intimate and fun at the same time. We instantly befriended her as well as other guides who had tagged along for fun. This safari tour included sessions on learning about Thai culture, how they grow rice, make coconut oil, the vast array of herbs and spices that go into a Thai curry, as well as a short baby elephant show. After this, we had the most incredible smooth silky coffee that was sweetened by a layer of condensed milk at the bottom That made me feel I had been drinking coffee all wrong my entire life. My main reservation about the elephant trek was that they generally treat the elephants quite harshly, but, to my amazement, the guide led the elephant through the woods by tickling her behind the ear with his toes! After the trek, we headed down to the shore in our minivan to board our now private boat for a great banquet out at sea. Our tour guide joined us. Per the protocol she shouldn’t have eaten with us, but after a lot of insistence and with enough food for the dozens, her and the whole crew joined us to tuck into this meal (we enjoyed their company and were happy that the meat dishes didn’t go to waste). As we headed further out, the gods were on our side – the clouds cleared up a little to give us a hazy yet lovely view of the setting sun. As part of a city tour, we headed up to Big Buddha in the afternoon: an attraction you cannot leave Phuket without seeing. It sits on top of the Nakkerd Hills between Chalong and Kata. Even with the short amount of time we spent there, the peaceful atmosphere at the foot of the grand statue was refreshing whilst looking out at the view of the whole island. The foot of the statue is covered with little wind charms that people have placed there in hope to ask for blessings, wishes or to give thanks. This was followed by a trip to the Buddhist temple of Wat Chalong and a walk through Old Town. Located on the edge of Old Town is the weekend night market. With a vibrant atmosphere, the market is full of stalls selling a vast array of things from clothing, make-up and electronics to jewellery, food and toys. The list is endless, just as is the market! The stalls that are set up for the weekend are amazing — the merchants set up a huge maze that you can get lost in and can’t help but to spend spend spend (why would you say no to designer T-shirts for £1!). I actually bought some beautifully-crafted jewellery boxes, essences and placemats as gifts for people back at home. One area of the market is lined with rows and rows of food stalls, selling everything from fruits, coconuts, freshly roasted sweet corn, fried grasshoppers (gross right?! ), to sweet fluffy cakes and desserts. I have to admit, some of these stalls really do get the mouth watering. Heading into Old Town, we decided to use the local bus instead of taking a tuk-tuk. 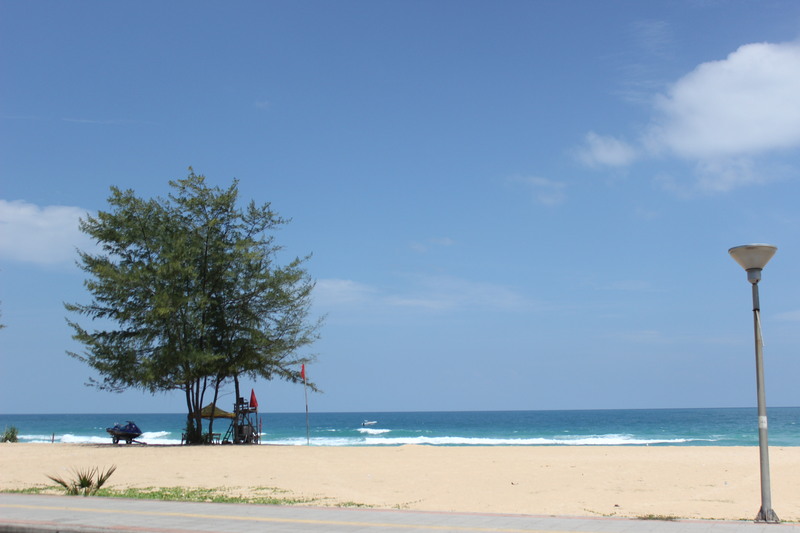 The local bus costs around 35 Baht per person from Karon Beach to the centre of Old Town. This was an experience I’d definitely recommend and a great way to meet the locals! We explored Old Town by visiting a number of Buddhist temples, as well as the Sikh temple (parents were adamant on it). Then we headed down to a small Buddhist vegetarian restaurant, on Ranong in old town, that looked more like a little hut but we definitely were not put off. Given that the area was surrounded by a number of temples, we were confident that the food would be purely vegetarian. Although it didn’t look like the most appetising of places, the food was phenomenal! 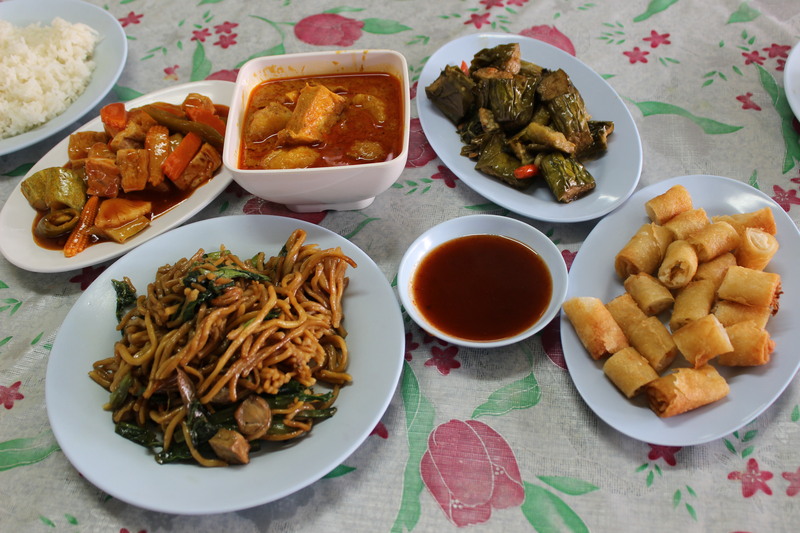 The array of noodles, Thai curries and spring rolls felt like authentic Thai cuisine. This had to be the best meal that we consumed on the whole trip (as well as the cheapest at few hundred Baht). For the life of me, I can’t remember the name of the place, but you’ll sure to find most places down that road will be amazing authentic home cooked thai food! Tip: Most Thai people consider fish to be vegetarian, so if you don’t eat fish and don’t want to take your chances, ask for Buddhist Vegetarian. We found that many of the smaller restaurants do try to alter the menu for you. One place even made a complete meal from scratch for us! A visit to Thailand is incomplete without a few massages along the way. The days we spent not exploring the islands, we headed down to the local massage parlours (the streets are lined with them) for a relaxing foot and leg massage, which felt after spending the previous day walking around. On the off chance that you choose to experience a full on Thai massage, I’ll prepare you now (trust me, I wish someone had prepared me): expect to not only get a full relaxing massage from the your neck down to your toes with strong vapour rub, but also to have the masseur walk up and down your back (just hope that you get a nice petite lady – I had a very butch one walk on my small frail frame). Most of all, expect every muscle in your body to be stretched to its limits! I think the once was enough for a lifetime. If the above didn’t sound relaxing enough, we took pleasure in spending a few days between trips to head down to the beach, sit back with a coconut and just watch the waves flowing onto the golden sands as the sun set on the horizon. We became regulars at one particular little stall along the beach where we shared stories and laughs with the old lady that owned it. Visiting the lady on our final night in Phuket was as emotional as saying farewell to family that you visit abroad. As we left, we were parting with a beautifully–cultured island that we called home for the past 14 days.